Orange County Wedding Officiants -The Clergy Network Of Southern California- www.legallymarried.com: The Clergy Network of Southern California - Winner of 2010 Bride's Choice Awards As Bestowed by WeddingWire! 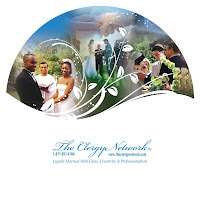 The Clergy Network of Southern California - Winner of 2010 Bride's Choice Awards As Bestowed by WeddingWire! January 19th 2010 – The Brides Choice Awards On Wedding Wire! Southern California – January 19th 2010- WeddingWire, the nation’s leading wedding technology company, just announced that The Clergy Network of Southern California has been selected to receive the 2010 Bride’s Choice Awards™ for Wedding Officiators. The Clergy Network of Southern California is among the top five percent of all vendors in the WeddingWire community, which includes over 100,000 wedding professionals across the US and Canada. Awards were given to winners across 19 different service categories, from wedding venues to wedding photographers. We are happy to announce that The Clergy Network of Southern California is among the very best Wedding Officiators within the WeddingWire Network, which includes WeddingWire and Martha Stewart Weddings. We would like to thank our past newlyweds for nominating us for the 2010 Bride’s Choice Awards™.